More then month ago together with Lisa Crispin we run a workshop “Questioning requirements: improving quality for everyone”. The reason why we came up with this workshop, was to teach and to empower people to question requirements. As a tester I know how important is to question statements, ideas, requirements, designs etc. As trainer I know that with a lot of confidence you can run for presidency. This is the story how we did that (without particular details in case you want to take the workshop in some other event ;) ). We had some challenges: we did not know how many people will come to our workshop and our time block was less than 2 hours. We took those restrictions and created a workshop, which we could easily scale. At the SwanseaCon we had around 32 participants, which we divided into 6 teams. Each team had a particular context to role play in a simulation. We emphasised that we wanted people to experiment and have fun. We tried to build safe space to learn and to try new things. We presented several tools that participants were invited to use to explore stories and to structure conversations with stakeholders (you can download them here). They were also free to use any other tool or framework they prefer. We explained that we as “stakeholders” wanted to create an app and gave each group a list of desired features. In our background story we used words like “deep analysis” and “market research”. User stories were written in ambiguous way with aim to provoke the need to ask questions. The task was to create a release plan, creating stories for the features. Especially noting what feature they would like to start with. All groups were extremely motivated, except one. There were lively discussions within the table groups and it was interesting to observe team dynamics. Especially interesting was to see that the group which struggled the most – none of them left the table or whole workshop. They were struggling together till the end. Another interesting thing – we as stakeholders got not so many questions as we expected to get. Just like in companies, our fictional teams were so busy working that they forgot that stakeholders are there in the room… We tried to interact with the teams, but nobody wanted our help and it looked more like we are disturbing them. After simulation was accomplished, each team presented their release plan. or the process they come up with. 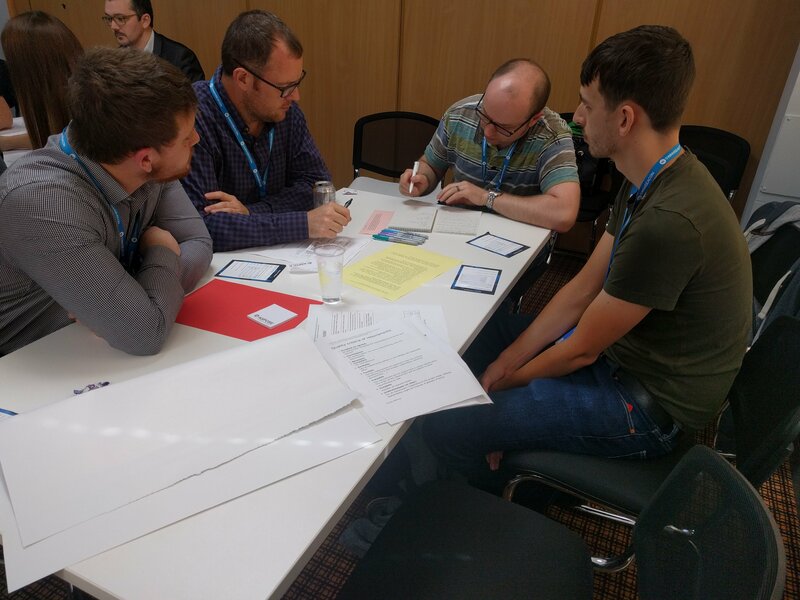 After that we started debrief and our attendees exceeded our expectations when they started to reflect on their working experience in their fictional team and usage of tools we presented. It was great atmosphere in the room and we all learned from each other. I think we managed to create a good workshop and would like to do it again at future conferences or other events. Some things what workshop attendees learned.